Commonly used torsional or compression springs mounted on the mandrel or a shaft of a door hinge to apply pressure onto the hinge’s plates when a door which is pushed open is required to close automatically after it has been released. 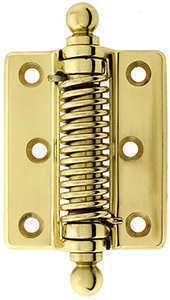 Springs for door hinges are a useful device as well as a safety measure in some cases. These springs can be easily found in stock at The Spring Store or can be made custom to fulfill your requirements by sending us a request for quote through our quick quote form at Acxess Spring. 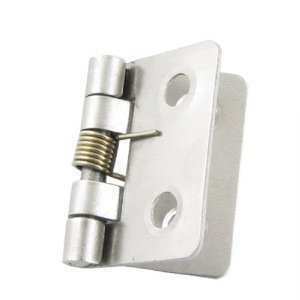 The torsion springs installed into your door hinges will cause your door to execute the effect of the twin saloon doors seen in old western movies where the “bandido” bursts through the twin doors yet the doors manage to close again once he is out of reach. The effect of the doors closing automatically is achieved by the torsion spring since one of its legs is mounted against the stationary plate while the other is mounted against the plate on the door to torque when the door is opened and apply pressure back on the door once it is released to return to its original free position. To start designing your torsional springs for door hinges, you must calculate the weight of the door and the amount of angular movement in degrees the door will swing or travel. One also needs to calculate how many hinges the door will need to have so you know how many springs you'll need. Since the springs will be working in parallel, you will divide the required force by the amount of springs you will use so that all springs work together to provide you with just the right amount. You must also consider the diameter of the shaft or mandrel of the hinge where it will be installed so that you don’t make a spring that’s too tight to fit over it. Knowing the space you have for the installation of this spring will also be of great help to make sure it will fit accordingly to fulfill its required functions. This means that you will have to measure the length of the space of the shaft or mandrel of the door hinge where the spring will be positioned as well as the outside space you can work with. Being aware of these measurements will give you the limits you have in regards to body length and outer diameter. Body length is based on your spring’s wire diameter and total coils while outer diameter is based on inner diameter and wire diameter. The diagram provided to the right shows you how to measure your spring and will help you determine which dimensions correspond to which measurement. Know which leg will be stationary and which will torque to determine the direction of wind. The next step is to figure out your material type. The most economical material choice is music wire. This type of wire is recommended for the indoors since it will not have to resist high temperatures, moist, or corrosive environments. The next option would be to use stainless steel for the springs for door hinges which are located outdoors. Stainless steel 302 is the most common and economical type of stainless steel wire so this would also be a great option for you. In case that you have a more complex environment where the door hinge is located, refer to our properties of common spring materials table for more material options. 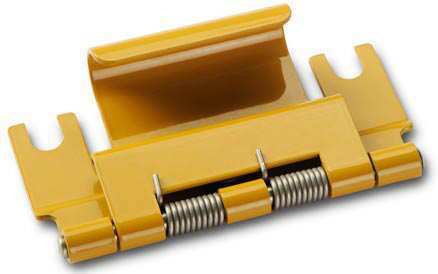 Once you have finished figuring out your torsion spring’s requirements to function accordingly on your door hinge, use Spring Creator to work out your torsion spring design fast. Select your direction of wind in step one and input dimensions within the discovered tolerances of your device into step two. 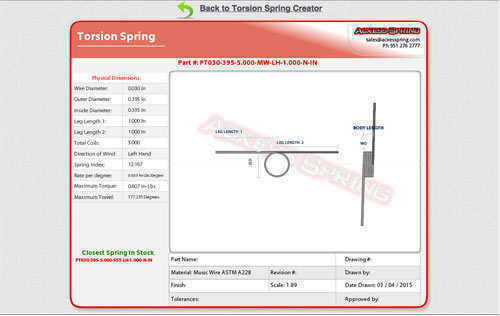 Click on “Calculate” and Spring Creator will calculate all of the parameters that have to do with your spring design from torsion spring rate per degree and spring rate per 360 degrees, to maximum safe travel and maximum safe load. To calculate the amount of spring rate you need your spring to have, divide the load by the deflection in degrees that the spring should travel under that load. If you haven’t met that load, perhaps your spring needs to be either stronger or weaker. The force chart provided on our calculator will tell you the procedures you must go through to make your spring either stronger or weaker. You might have to make a few adjustments to your spring before the design is ready but the calculator will make this a quick and easy task. Shop for stock springs for hinges through our torsion spring calculator. You will get many suggestions of similar springs in stock as you’re working on your design. In case that you aren’t able to find the ideal spring for your door hinges, you may request a quick quote through our calculator as well. The calculator will generate a live blueprint of your torsion spring design for door hinges and send us the blueprint and analysis along with your request.